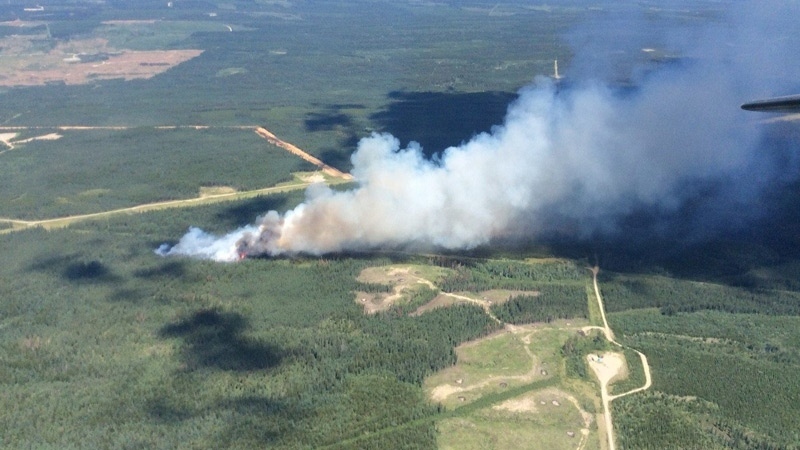 A wildfire burning southeast of Hinton has nearly doubled in size but is still not threatening any communities, according to provincial officials. In an update late Thursday morning, officials said the blaze had grown to roughly 1250 hectares but stressed this was an estimate because smoke had obscured the fire’s perimeter. The fire is about 15 kilometres south east of Hinton. An update later Wednesday evening pegged the fire’s size at about 700 hectares, up from about 350 hectares that afternoon. Officials said crews remained at the scene overnight and built a six-kilometre fire guard along the north edge of the fire, and another two-kilometre guard to the south. Airtankers, dippers and firefighters were expected to remain on the scene to bring the fire under control. Winds from the west were pushing the fire east, southeast, according to the province’s update. Drivers were advised to avoid travelling on Robb Road, to give crews space to work.